A table of contents in Word is based on the headings in your document. For each heading that you want in the table of contents, select the heading text, go to Home > Styles, and then choose Heading 1, 2, or 3. Put your cursor where you want to add the table of contents. Go to References > Table of Contents, and choose Automatic Table 1 or Automatic Table 2. If you make changes to your document that affect the table of contents, update the table of contents by right-clicking the table of contents and choosing Update Field. Select the text you want to include in the table of contents, and then on the Home tab, click a heading style like Heading 1. Do this for all of the text you want to show up in the table of contents. 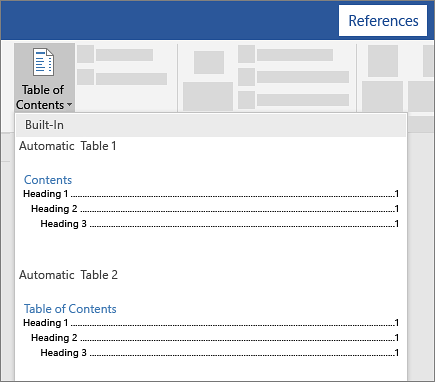 Word uses the headings in your document to build an automatic table of contents that can be updated when you change the heading text, sequence, or level. Click where you want to insert the table of contents – usually near the beginning of a document. Click References > Table of Contents and then choose an Automatic Table of Contents style from the list. Note: If you use a Manual Table of Contents style, Word won't use your headings to create a table of contents and won't be able to update it automatically. Instead, Word will use placeholder text to create the look of a table of contents so you can manually type each entry into the table of contents. 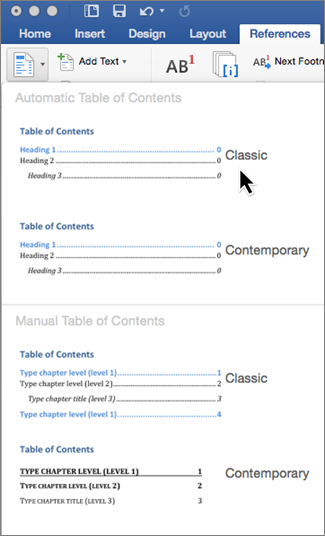 If you want to Format or customize your table of contents, you can. For example, you can change the font, the number of heading levels, and whether to show dotted lines between entries and page numbers. Word Online lets you update a table of contents that's already in your document, but it doesn’t yet provide a way to create a table of contents. To update a table of contents, click in the table of contents. Then go to References > Update Table. For more detailed ways of updating the table of contents, or to create a table of contents, use the Edit in Word command to open the document in your desktop version of Word (Windows or Mac). When you save the document, you'll be able to keep the table of contents up to date in Word Online. To learn more, see steps for creating a table of contents in Word for Windows or Mac. If you don’t have Word, you can try or buy it in the latest version of Office now. Got suggestions for this feature? Make your voice heard and vote for this feature at word.uservoice.comword.uservoice.com. For a hands-on guide that steps you through the process of creating a table of contents, download our Table of Contents tutorial. Or, in desktop Word, go to File > New, and search for table of contents.